Fällkniven's Northern Light Series (NL) is a very impressive lineup of knives expressing power and our heritage from the Swedish Vikings. The NL2 Odin is the lineup's second largest knife with it's 6,5 mm thick and 200 mm long blade. The laminated VG10 steel together with the convex grind delivers a world class chopper. 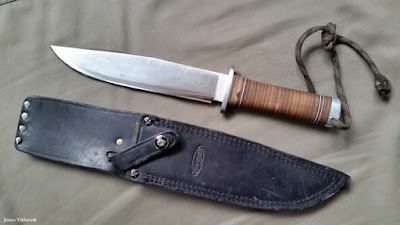 This particular knife has an interesting history s it got to follow Nicklas Lautakoski on his survival adventure in the TV production Naked and Afraid. The challenge was to survive all naked for 21 days out in the Australian bush only carrying just one object. Nicklas chose to bring his dear Odin in combination with his fantastic personality. A combo that gave Nicklas a adventure for life. You can see more about the adventure by clicking HERE. Top down; NL2 Odin, A1 and F1. The initial pics in this post are taken when the knife was new. The pics below are taken after the adventurous month of hard usage. The edge has been resharpened after the survival adventure. 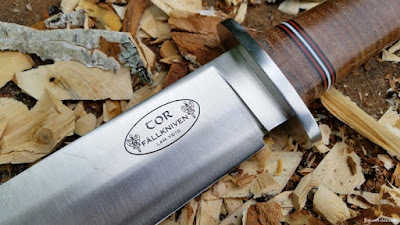 To see my other posts about Fällkniven's products click HERE. During the last year I've executed a bushcraft knife field test comparing 15 different robust knives to each other. 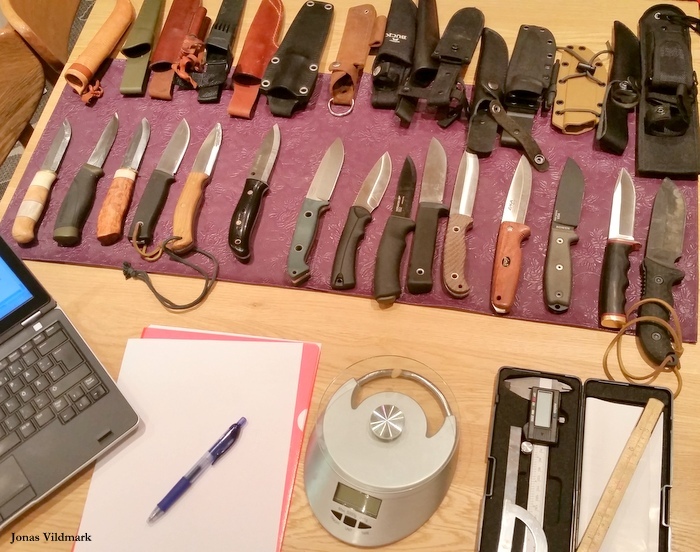 The results of this test are shown below and are based upon my personal opinion of each one of the 15 knives after spending time with them by the campfire, out hunting and in the workshop. I think it's wonderful how the interest for Bushcraft (Woodcraft, Woodlore, Forest Life) are steady growing all over the world. My definition of Bushcraft is; keeping it simple during outdoor activities like; hiking, canoeing, fishing, hunting or just hanging out by the camp fire. By learning how to make use of what the woods offer and reading the forest's signs I can get the most out of my time spent in the field, and all of this in a sustainable way. Bushcraft is an umbrella name for old and new knowledge how to coexist with nature. Many of these skills were the everyday tasks of our forefathers; whittling, fire, harvest, field cooking and navigating. For me Bushcraft is humble respect towards my surrounding (friends, animals and the environment). Often Survival is mentioned in the same context as Bushcraft as Bushcraft can be a part of Survival and vice versa. Hence the words Survival Knife and Bushcraft Knife. 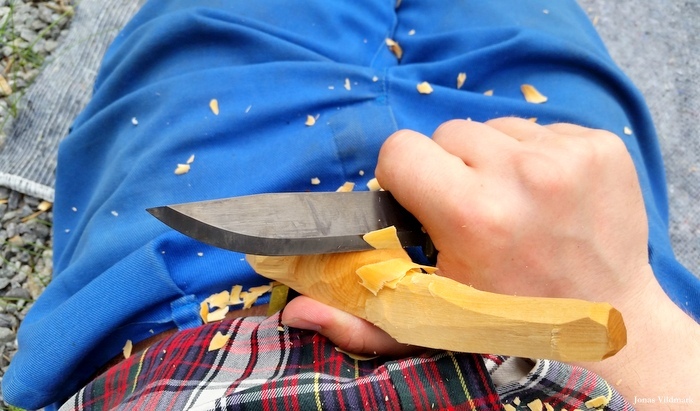 The knife has gotten an almost sacred status among us bushcraft enthusiasts. But I want to under line the fact that you can bushcraft with any knife, or no knife at all for that matter. 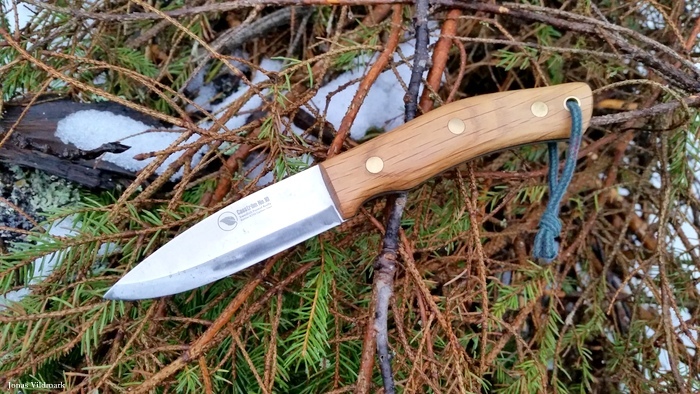 But even if the knife isn't the most important tool when spending time in the great outdoors; the knife also has gotten to play an important role as a romantic symbol of self sufficiency and adventure. As a result of the increasing bushcraft interest most knife manufactures today offer one or several modern bushcraft knife models. Below I'm trying to summarize the special features find in these new products. To conclude: a robust mid size fixed blade capable of handling fine sloyd as well as wood chopping. The edge should be easy maintained and the spine capable of producing sparks when needed. This is how a modern bushcraft knife often looks like. However I want to point out that knives with less robust specs than this has successfully been used in woods since dawn of mankind. The absolute most important aspect of a knife is the hand and mind holding it. When in my thoughts on how the ultimate bushcraft knife looks like I decided to look into my knife collection and pick out the knives somehow matching the above modern bushcraft knife definition. The 15 knives picked out have been my field friends for some time now; whittling, hunting and cooking to compare them to each other. I'm fully aware of that there are many other bushcraft knife models out there on the market, but these 15 was the ones I had at hand when the test started. For instance a number of interesting modern bushcraft knife models were released during my test; Buck Selkirk Knife, ESEE Camp-Lore RB-3, Helle Temagami, Brusletto Rondane, Fällkniven F1 Pro and Morakniv Garberg. These models together with older models like; Condor Bushlore, Ben & Lois Orford Woodlander 4", Marttiini Full Tang Knife, Gerber Bear Grylls Ultimate Pro and Staaf Knives Bushcraft Evolution I look forward testing in the future. Inspired by my latest saw test I've chosen to publish my test results by using a number of line up pictures showing the ranking between the 15 knives looking at the features; Blade Length, Blade Thickness and Knife Weight. All measuring are made by myself therefor the numbers can differ from the manufacturer's specs. I hope these line ups can help you in your thoughts regarding these knife models. As I do a lot of whittling with my bushcraft knives I also have judged each knife on how nice I think they are when carving wood. These points together with me judging the knife's three main components; the Blade, the Handle and the Sheath sums up to a total score helping me to find my over all favorite knives among the 15. If you have questions regarding my test method you're welcome to contact me. The 15 test objects are, in alphabetical order. The below picture show a blade length comparison between the 15 test knives. The shortest blade is on the left and the longest to the right. 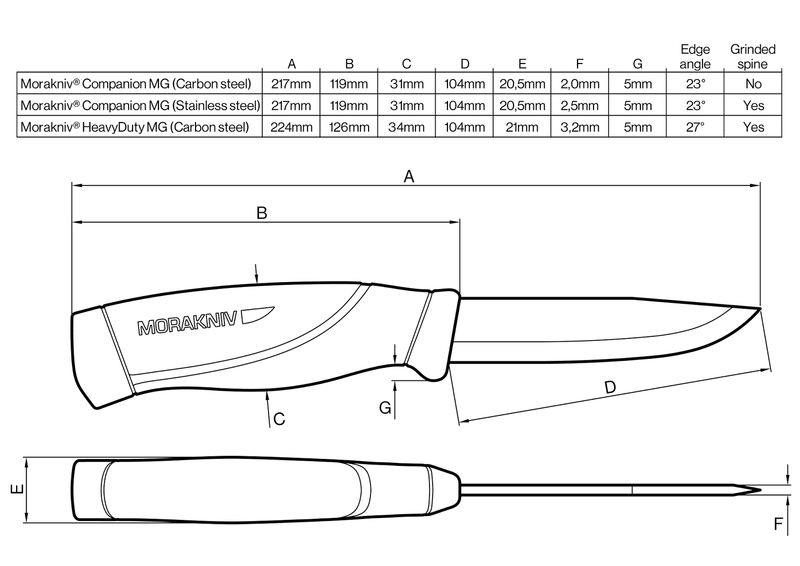 If you click on each knife model you can read more details about the knife and the manufacturer. This is what it looks like when i line up the test knives according to the thickness of their blades. Thin blade to the left and thick blade to the right. Here you have the lightest test knife to the left and the heaviest to the right. The sheaths are not included when weighing. The variation in price among these 15 test knives stretches between 199 SEK and up to 3500 SEK (purchase price in Sweden). Even if I try to ignore the price tags while testing the capability, comfort and design of the knives I can mention the tree most expensive and the tree cheapest. The three highest priced knives among the 15 are; the Spyderco Bushcraft, the Benchmade Bushcrafter and the Karesuandokniven Willow Gouse. The three low priced are; the Morakniv Bushcraft, the Morakniv Companion and the Kayoba Knife 770180. You can find more price info by clicking on each knife model link in the text. It's almost an impossible task picking out just one ultimate bushcraft knife as it all depends on what task I'm doing with the tool (fine carving, chopping, hunting, fishing, cooking). Adding to this also all the peronal preferences of each and one of us happy bushcraft junkies. 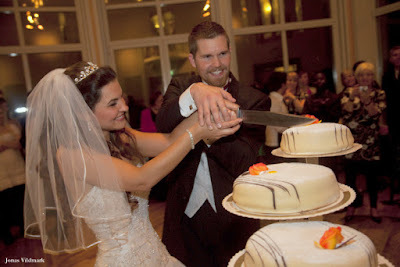 Personally I almoust never batoon with my knife. Instead I let my axe do the chopping. Therefore I often find myself bringing smaller thin bladed knives not using full tang into the woods. 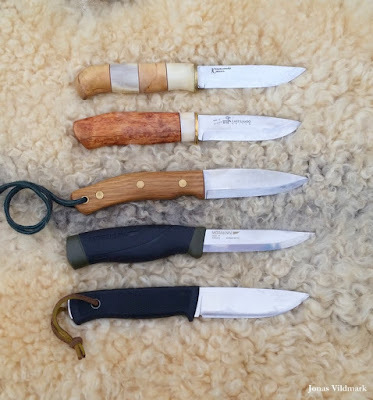 Some nice exampels of "weaker " knife models that also manage most bushcraft tasks are; the Classic 2/0, the Classic Original1, the Craftline HighQ, the Basic 511, the Giron and the Pendleton Lite Hunter. I really liked all these 15 test knives. None of them disappointed me so much I wouldn't take them back out there again. But when I summarize all of my testing the final and total ranking looks like this, with the test winner to the left. By clicking on each knife model you can read all my motivations as well as more details about the knife and the manufacturer. I deeply recommend you to read about all the knives to get the most out of this tests analysis. Here you have some shorts comments about the knives placed among the top five. The Willow Grouse 3524 gets the highest total score when looking at best blade, best handle, and best sheath. Also the whittling capability of this knife is very good. And as a bonus the down to earth and warm design of this knife makes my bushcraft heart beat lively. Survival Knife 3586 share many of the highlights of the Willow Grouse 3524. But the somewhat wider blade and the not so cylindrical handle brings down the total score a bit. 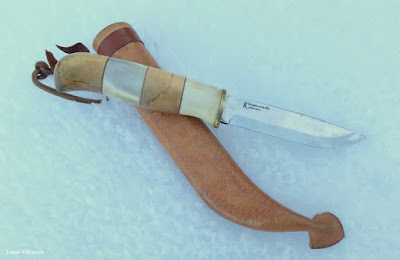 Casström No.10 has one of the most typical modern bushcraft knife design. t's a really sturdy knife offering an interesting handle and sheath design (see the Dangler). However the thickness of the blade is a bit too much for my taste, therefore a No.10 ends up in a strong 3rd place. The Companion HD has an amazing blade for whittling. However personally I think the HD's thicker handle belly is a bit too fat. But this strong light weight low prized knife is fantastic bushcraft knife. To be honest I thought the Companion HD would end up on top in my test but in the end the waist measure together with the plastic sheath brought down the total score. The F1:an's impressive balance and premium grip manage to charm the scandi grind lover inside of me. The F1's convex grind edge deliver an outstanding sharpness and endurance. Adding to this; Fällkniven's nice leather work, result in a strong 5th place. As the smoke lightens and the test is over I get the nice surprice of seeing that the top five contenders are all Swedish products. I'd like to see this as an indication that we Swedes should be very proud of our nordic way of living, especially in this bushcraft boom era. The fact that all the test knives using a scandi grind edge placed themselves in the top is a good indication of my love for this practical edge profile when it comes to bushcrafting. However I have to say that none of the 15 knives made me so disappointed I'd never will use it again. And even if the test's real fat boy; the Schrade Frontier SCHF36 didn't get the test's highest score I want to lift my hat of to the SCHF36's unexpected pleasant balance. Another surprise was the high score of the low price knife Kayoba Knife 770180. It's been a pleasure and an adventure comparing all these knives in the same field test. Of course I've learned a lot about each knife, but what I cherish most is the fact that I've gotten a bit further in my philosophical thoughts about what I want in a knife. I hope you have found these test results and knife posts interesting and inspiring. Please let me know if you have any feedback or if you just want to talk about your favorite bushcraft knife. I hope seeing you at the Bushcraftfestivalen 2016 August 12th-14th in Gottröra Sweden. Then we also can sit down by the camp fire and discuss our beloved edge tools. 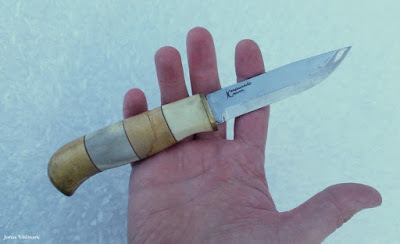 The knife manufacturer Karesuandokniven has been producing knives now for about 40 years way up in the Swedish North. As an adventurous teenager I got my first blades from Karesuandokniven; it was the Moose Special 3507 followed by this Willow Grouse 3524. The knives has performed really good thought the years and since then I've also had the pleasure of getting acquainted with a number of different knife models from the manufacturer. To see more reviews on Karesuandokniven; click HERE. During last year I executed a field test focusing on bushcraft activities. In the Bushcraft Knife Field Test 2015; 15 different robust knifes are compared to each other. You can see the test by clicking HERE. Two of my Karesuando knives enlisted for this test and both did real good; the Willow Grouse 3524 ended up at first place and the Survival Knife 3587 in second place. Let's take a closer look at the Willow Grouse, also called Ripan in Swedish. The 3,2 mm thick and 102 mm long stainless steel blade made of Sandvik 12C27 has a "mora knife like" shape making it a joy to work with. Back in 1993 when I bought this knife the out of the box sharpness wasn't the best, but after some care it has been performing well. When I compare the older knives to the newer; Karesuandokniven's quality regarding the edge has gotten much better. The spine of the blade has a comfortable rounded shape for carving. But if you like to use the spine on your Ferro rod you can always flatten an area of the spine with your sharpening tool (as seen on the Survival Knife 3587). The knife has a long tang surrounded by Birch, Rein Deer Stag and Brass and the handle offers a very comfortable cylinder shaped grip including a discreet finger guard. As you can see the shape of the back of the handle is inspired by the shape of the Willow Grouse. The leather sheath is fitted with a plastic inlay and offers a good fit for the knife. 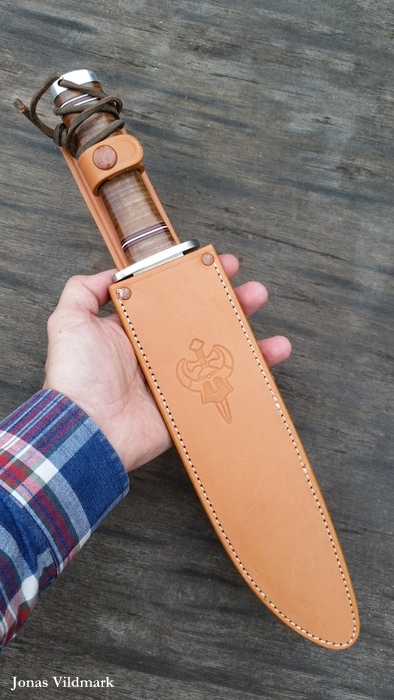 The classic design of the sheath enables carrying the knife dangling below the belt. The Ripan is also available in a more exclusive version using a blade delivered from the Swedish forge Damasteel in Söderfors. Swedish craftsmanship combining; Swedish steel, wood, stag and leather in a comfortable fixed blade knife featuring a Scandi Grind edge is according to me a unbeatable package when it comes to practicality and beauty. Willow Grouse 3524 almost got the highest score in my bushcraft knife test regarding the four categories; Blade, Handle, Sheath and Carving. I say "almost" as the Morakniv Companion Heavy Duty got one more point to its blade compared to the Willow Grouse 3524. Lately Karesuandokniven has adjusted their price tags; now offering their knives at a higher price. But I think that is fair when looking to the quality you get for the money. I really don't have anything bad to say regarding the Kresuandokniven Willow Grouse 3524, other than I usually choose a bit smaller blade for my EDC use when out in the woods, like for instance the smaller sibling Karesuandokniven Giron 3537. Nice to see that my old knife from the early 90's won the Bushcrat Knife Field Test 2015. But even greater is the fact that top 5 in this test were all Swedish knives. As I mentioned; check out the test and please feel free sending me you feedback. The Karesuandokniven Willow Grouse 3524 is a laid back winner delivering a clean, casual and competent cut to the Woodsman. the Willow Grouse is my pick when in times I need a more sturdier knife for bushcrafting. During the last year I executed a field test focusing on bushcraft activities. 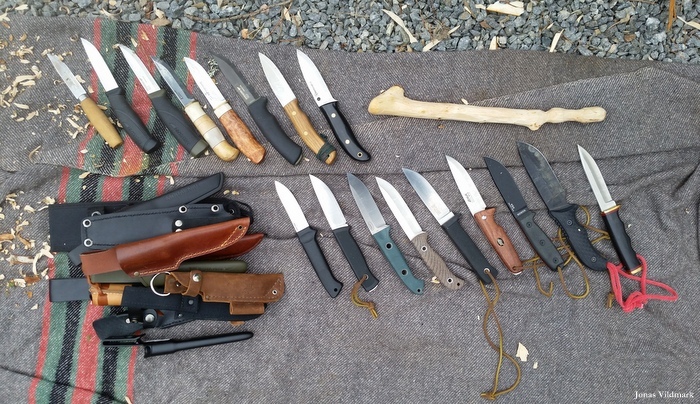 In the Bushcraft Knife Field Test 2015; 15 different robust knifes are compared to each other. You can see the test by clicking HERE. One of the contenders was the Casström No.10 Swedish Forest Knife, which we now shall take a closer look at. Mr. David Cassini Bäckström is a 3rd generation trading entrepreneur in the beautiful Lapland of the northern part of Sweden. David started the company Casström AB together with his wife back in 2007. The company offer outdoor products and from the start they focused on other manufacturer's knives. But after David recognized a growing demand for a pure bushcraft knife he decided to produce one of their own. 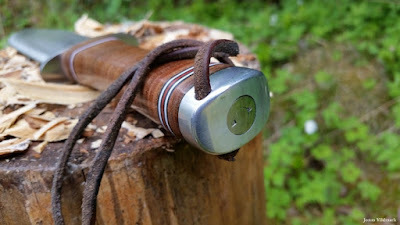 The first version of the Swedish Forest Knife was launched in the Autumn of 2012. This knife differs from today's version. Initially the Swedish Forest Knife had a shorter handle and a bigger finger guard. 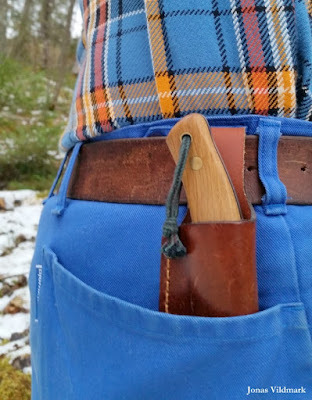 After listening to the customer's feedback Casström in 2014 updated the design with a longer and sturdier handle and a more practical sheath. Casström AB are still offering other knife brands together with their own and today the company staff of about 10 persons is based in Sweden and in the UK. The Swedish Forest Knife is today offered i two different sizes and in a range of different combinations of; steel, edge profile and handle material. You can also get a stripped blade for making your own knife. 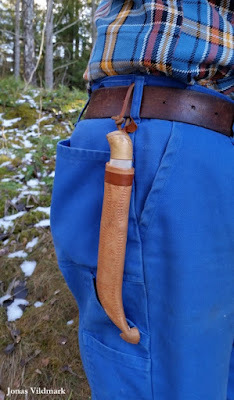 The leather sheath is offered for both left and right handed carry and with or without a ferro rod holder. Also a additional belt loop called the Dangler is offered for low carrying. My knife has a 97 mm long and 3,7 mm thick blade made of the carbon steel Böhler K720 with a hardness of 58-60 HRC. The full tang spear point shaped blade has a Scandinavian grind with a 24° angle. 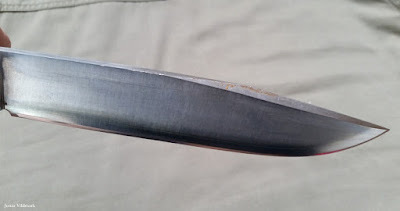 The spine of the blade has sharp edges if you like to use the knife on your ferro rod. The oak scales and the black plastic liners are hold in place by glue and three brass rivets. The knife is delivered with a well made 3 mm thick cow leather sheath. No insert is used and a drainage hole is to be found at the tip of the sheath. A nice thing about this sheath is that it actually fits several of my other knives. No.10 is a very good representative of the modern definition of a bushcraft knife. The clean and down to earth design is well merged with this tool's toughness and functionality. Although the blade is almost 4 mm thick I think that the balance and edge profile of the blade makes the knife a pretty good wood carver. The No.10 is delivered with a nice sharpness but after some additional edge care the edge cuts even better. The balance and roughness of this knife makes it one of the few Scandi grind blades I feel comfortable chopping with. The Swedish Forest knife No.10 weights 179 g and a thick blade like this can withstand most abuse. But I never recommend using a knife as a pray bar, a knife is made for cutting and slicing. My hands like the No.10's somewhat special handle shape enabling different practical carving grips. With the proper care this prize worthy knife provides a robust and more than life long forest friend. 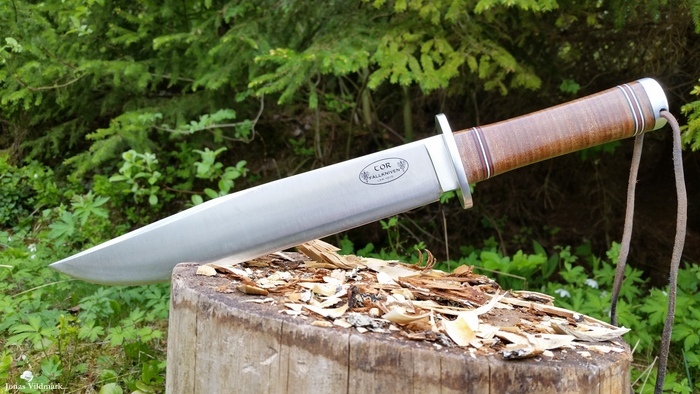 But what could one not to expect from a knife named the Swedish Forest Knife. The knife also did very well in my Bushcraft Knife Field Test 2015. The knife ended up at 3rd place among 14 impressive knives. If you wanna see more about the Casström No.10; check out the mag article I wrote on the knife in issue No.3 - 2015 of Vapentidningen. During the last year I executed a field test focusing on bushcraft activities. 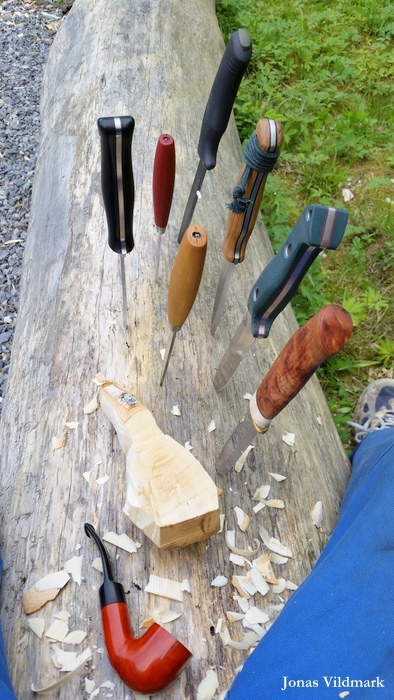 In the Bushcraft Knife Field Test 2015; 15 different robust knifes are compared to each other. You can see the test by clicking HERE. 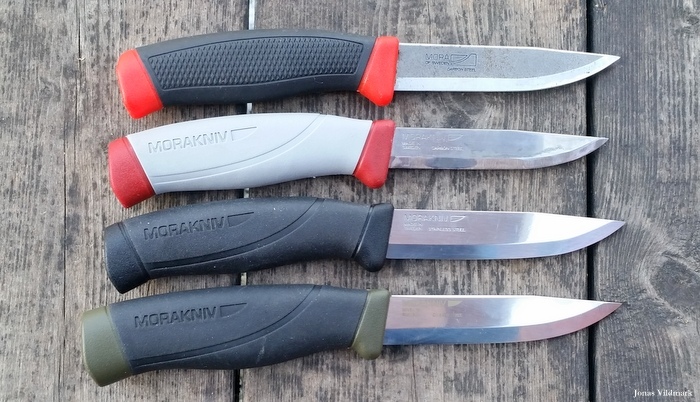 One of the test's contenders was the Morakniv Bushcraft Black, which we now shall take a closer look at. 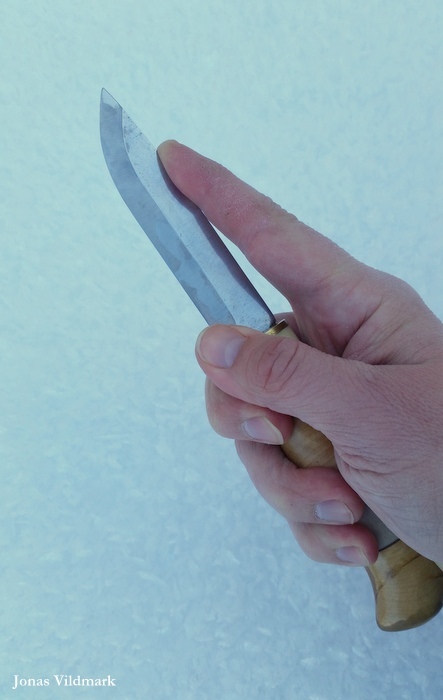 The history of the mora knife goes back to the iron age and the era of the Vikings. Archaeological findings indicates processing of iron in the area of Ovansiljan around this time. Since then the craftsmanship and skills of the tool smiths has been carried on from generation to generation. The knife culture grow strong around the village of Östnor in Mora Dalarna Sweden. Here Frost-Erik Ernström founded the Frost Knife Factory in 1891. This got to be the foundation of what we today know as Morakniv AB. Around that time several manufacturers in the area produced mora knives. In 1912 Eriksson & Mattsson's Knife Factory was founded by Krång-Johan Eriksson and Lok-Anders Mattsson. This company later turned into the brand KJ Eriksson AB. By the 1920's the handle of the popular mora knife got it's red color and during the second half of the 1900's plastic revolutionized the industries enabling new design possibilities. As a result of this we also got the well known mora knives of the 80's using rubber and plastic in the handles. In 2005 KJ Eriksson and Frosts Knivfabrik merged and created the brand Mora of Sweden. Today the company offer cutting products via the two brands; Morakniv and Frosts where Morakniv is handling crafting tools and outdoor products and Frosts deliver tools designed for the food industry. 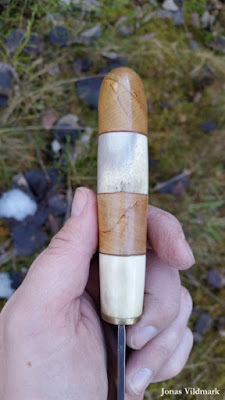 Before the longed for modern bushcraft knife could see the day of light in Dalarna the company's R&D department had their hands full testing different concepts, partners and prototypes. 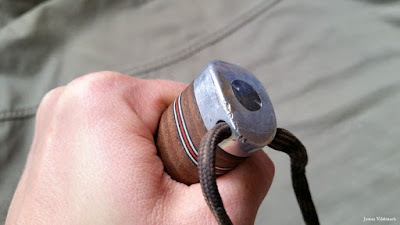 And finally around year 2009 the curius bushcraft audience could put their hands on a Mora Bushcraft. Then after a couple of design adjustments the Bushcraft Black as we know it today was ready. 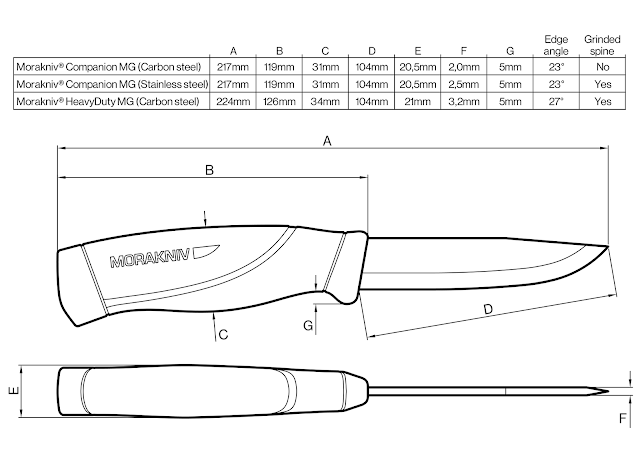 By 2014 the eaven bigger Morakniv Pathfinder was launched together with the Morakniv Tactical. These models added the MOLLE feature to the sheaths. This year (2016) Morakniv celibates their 125th anniversary by changing their company name into Morakniv AB and some new product launches. Bushcraft Black, Bushcraft Survival Black, Tactical and Bushcraft Survival Orange are the base of the Bushcraft lineup. These knives are meant as a more robust complement to the so popular Companion series. The four mentioned products are basically the same knife except for Orange using a stainless steel blade and the optional serrated edge (SRT) of the Tactical and Black. And the modular concept plastic sheaths are different equipped pending on knife model (sharpener, ferro rod or MOLLE). As the sheath base structure are the same you can mix the Bushcraft knives and sheaths, including the knife model Morakniv Bushcraft Forest. Top down; Pathfinder, Bushcraft Black, Bushcraft Survival Orange and Bushcraft Forest. The MOLLE vest in the pic comes from Snigel Design. Bushcraft Black feature an impressive 3,2 mm thick and 109 mm long black C100 carbon blade coated with DLC (Diamond Like Carbon). Both the DLC and the 4° wider edge angle are very durable on this knife (most mora knives feature a 23° edge angle). If you look closely on the factory edge you can see a micro edge. But without problem I've been treating this Bushcraft Black as any Scandi Grind edge when sharpening. Compared to the Morakniv Classic series; of course the Bushcraft Black feels very bulky. But I still think the Bushcraft Black manage pretty well when doing finer whittling. To spare your left thumb when carving I can recommend you to round the sharp 90 degree spine on the front part of the blade. When taking care of the game while hunting; the plastic sheath is easy to clean. Also the rubber handle offer a perfect grip even when wet and bloody. I know there are some voices complaining over these knives not feature a full tang. But I've never had any strength lacking problems during my usage. But soon the full tang fans will be able to enjoy the Morakniv Garberg evalible this Spring (2016). Some call the Garberg Morakniv's first full tang, but in my eyes Garberg is Morakniv's third full tang model launched. The old hunting models Morakniv Forest Lapplander 90 and Morakniv Forest Lapplander 95 has been using their full tangs for some time now. I'm really looking forward testing the Garberg soon, together with his siblings Kansbol and Eldris. I think Morakniv has done a great job expanding their product lineup by adding these sturdy knives. The Bushcraft Black is a very nice roughneck, but I'm also very grateful Morakniv still produces their fantastic Classic series. The Bushcraft Black ended up at a 6th place in my bushcraft knife field test. The reason for it not getting a higher score was the, in my opinion, too asymmetric handle. If you wanna read more about the Morakniv Tactical and the Morakniv Pathfinder; take a look at the mag article I wrote for Vapentidningen in 2015. More about the mora knife history you can find in one of my mag articles inside Sweden's oldest magazine; Svensk Jakt. Other posts on Morakniven can be seen HERE. During the last year I've conducted a bushcraft knife field test comparing 15 different knifes. You can see the test by clicking HERE. One of the test objects was the Kayoba 7700180. The design of the 770180 is very strongly influenced by the Böker Pathfinder. A stainless steel hollow grind drop point blade fixed in a dark colored wooden handle with brass details. The handle bellow has distinct finger grooves offering a secure but inflexible grip. By inflexible I mean that the finger grooves doesn't invite for backhand and other alternative grips. But the fact that the handle although is pretty straight and long makes the knife OK to handle. As always the sheath is compromised on a budget knife. The sheath made of artificial leather has a classic american hunting knife design. A bit surprising this budget product knife placed it self in a pretty good 9th place in my field test. The knife is delivered with a sad edge but after sharpening and maintaining the edge the knife gets pretty nice. It's the overall design of the knife that leads to this score result in the test. The long handle fits my hand in a decent way. So if you don't mind having to sharpen the knife often and the unsexy fake leather sheath; I think the Kayoba 770180 is worth testing. 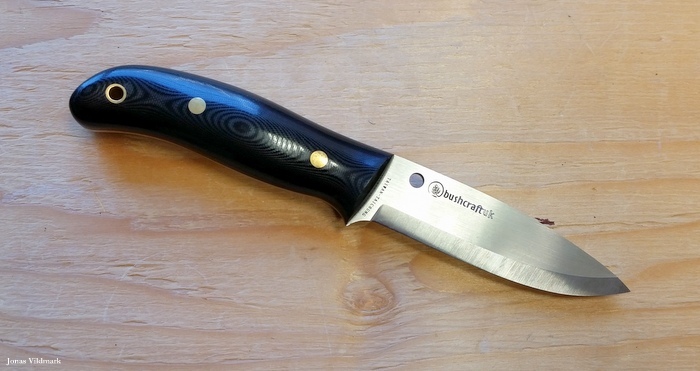 You get a decent beginners bushcraft knife in this 199 SEK knife.